Through the magic of Facebook, I've been messaging my niece, Elaine who lives in the Sonoma Valley of northern California. I said she should come visit me; she replied she would if she could go wine tasting in the whole country. I quipped back that we could wine taste all day, every day. And I wasn't kidding. 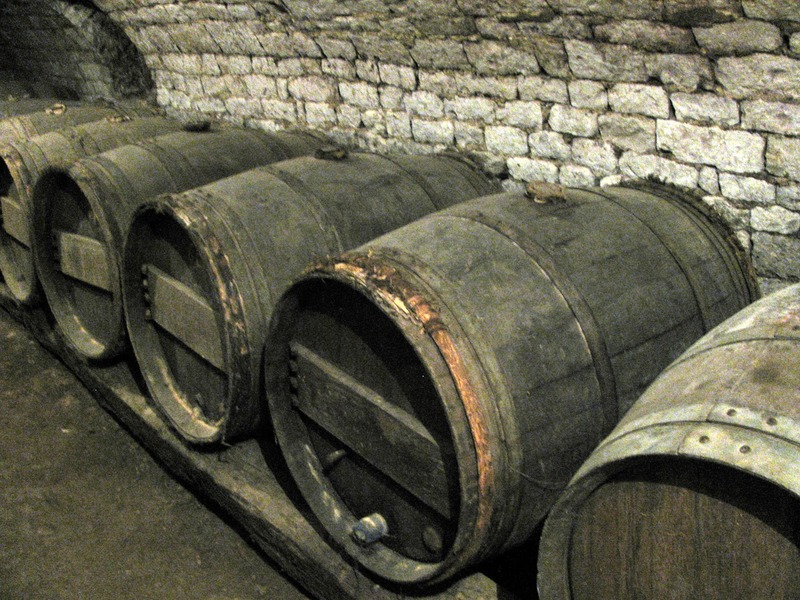 France is full of tiny wineries whose wines never make it to the big markets here, much less to the States! So I dedicate this post to Elaine. This is wine tasting in my neck of the woods. 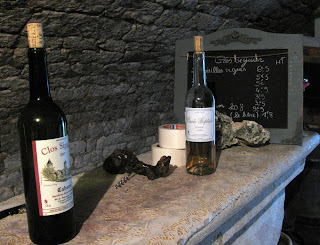 Clos Siguier is located literally at the end of a one-lane road. 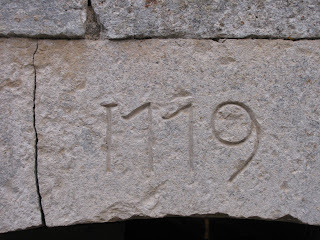 The address is Montcuq, but believe me, we were deep, deep in the country when we found the small cluster of buildings of the winery. Monsieur the Elder was resting in the house; Monsieur the Younger was at a wine fair in Paris. But Madame the Elder was happy to pull on her sweater, brave the cold, drizzly rain, and open the cave for us. No fancy gardens, no art work on the walls. This is not your elegant Mondavi winery of the Napa Valley nor any of those tourist destination tasting rooms of the Sonoma. This is French rural wine tasting at its best. The cave was so dark that even with the lights on, I had to use my flash and doctor up the shots of the wine barrels in Picasa so you could even see them. Prices were written on the small board. I chose a 2007 AOC Cahors that was listed at 5,50 euros a bottle but which Madame sold me for an even 5 euros. My friend, Maggie bought half a case of her favorite. They even sell vrac here. I read up on the wine and the vigneron; both are well-respected in the world of Cahors wine. Not one of the very famous producers, but a quality Cahors at a good price. I was not disappointed in my choice. And BTW, this wine from this tiny winery actually is exported to the States! So, Elaine....ready to come to France for some wine tasting adventures in the countryside? This is only one of thousands of little wineries we can visit. I'm game if you are! 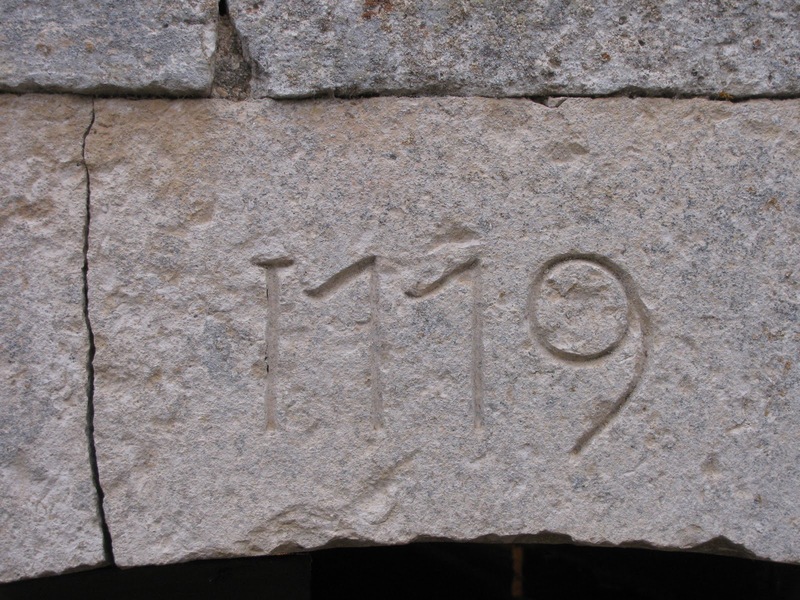 1779...carved in the stone lintel above the cave door.